So they say you shouldn’t judge a book by its cover. Well that’s true enough I guess, but what if you already read half of it and didn’t like it? That doesn’t count right; because you gave it a shot? Well I’m glad I gave this game a second chance. Look at me Ma! I’m invisible! Oh, you can’t… right. 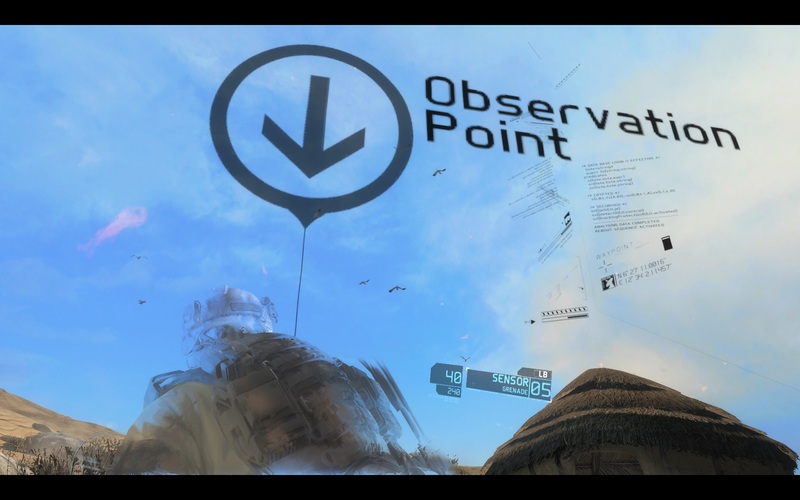 Future Soldier is another military FPS set in the present/future-ish time. So you’ve got a some nifty toys that we enjoy along with some tech that isn’t quite available yet or if it is, not up to these standards. The story is generic enough, but solid enough for an FPS. There are some bad guys doing some bad stuff and you and your super group of super friends need to go in there and lay down the law. Visually the game is mostly nice. If you can get past the fact that you’re either fighting the clone wars or that every bad guy out there only has a few ways to dress and some jaggies, it’s not bad. FS has got a great tactical feel to it. Your cloak (used liberally) is always on if your crouched or prone, but turns off if you shoot or run around. You don’t have to remember to turn it back on. It’s kind of nice to not have to worry about it, but at the same time I feel the same way about regenerating health in shooters. It’s nifty, but not all that great. I wasn’t quite sure where to go because the game wasn’t quite linear enough for me… if only they had implemented some form of overly obvious system of hand holding to lead me to my objective. What it does almost right in this area is when you get shot down, a buddy has to come over and help you “back into the fight”. I put that in quotes because all they really do is run to you and give you a hand back up. If all you needed to do was get back on your feet to recover from getting shot a few 20 times, they probably severed something that a secret handshake shouldn’t be able to fix. Maybe they should bring back some good ‘ol “give it a second while I patch myself up” mechanic. It’s not anymore realistic to have a handshake get you better than it is for one bandage over your leg is it? The tech kind of adds to that cool factor on how the game is played. You can modify your weapons to fit your situation and chuck little balls of sonar-filled goodness to tell you where baddies are. I already mentioned the almost OP cloak (bad guys can sense you when you get close). 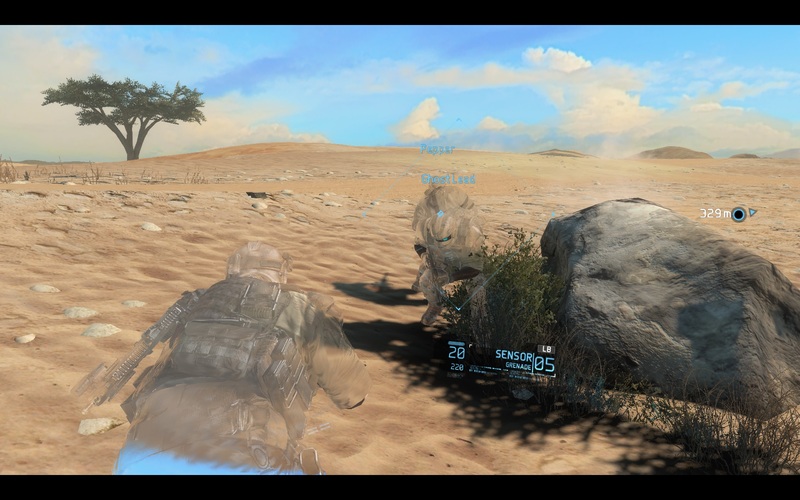 Another cool thing is the x-ray mode for your vision. It helps point out bad guys and gives you vision when vision is hard to come by. 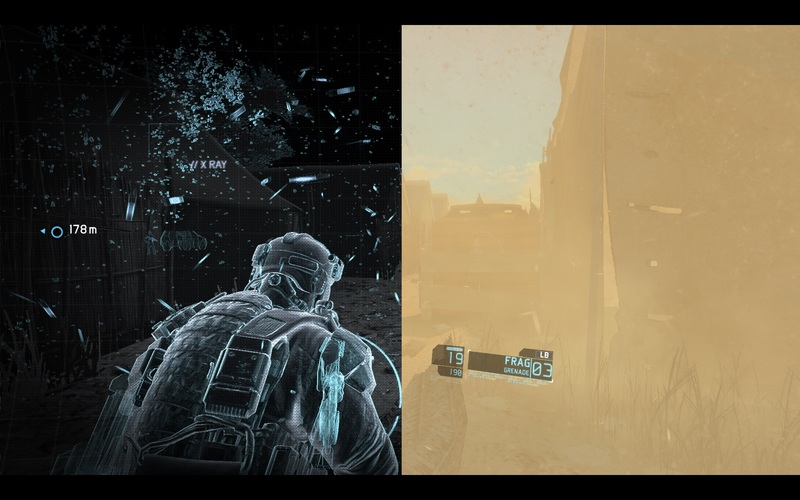 On the left is with x-ray vision turned on and on the right is what’s happening in real life mode. X-ray comes in pretty handy, not gonna lie. The A.I. is also not bad. They have a sync fire mechanic where you can mark a few targets and then with the press of a button, you can tell your homies to kill all the bad guys at the same time. I kind of felt like one of those bosses that tells everyone else to do things while I just took a leisurely stroll through the desert land. I would find two bad guys, mark and execute with my team. I almost cleared the first mission without firing a shot myself. They are more accurate and don’t really need to stop for ammo so I figured why should I waste my precious bullets? This brings me to what I didn’t like about the game. So did I mention that they have multiplayer and that the game could be played cooped with three buddies? Well it does and it can. This is neat and would probably have saved the game from itself and the action-filled parts if I didn’t hate the movement in this game. The cover was neat, but you couldn’t take cover everywhere, even when it felt and/or looked like you should. The running is horrible and should be called a mad dash. The somewhat tight controls go out the window when you run. Gun control is tight, and there is some issues if the weather is acting up so actually this part isn’t too bad. It’s not swimmy most of the time so I’ll give this a pass. 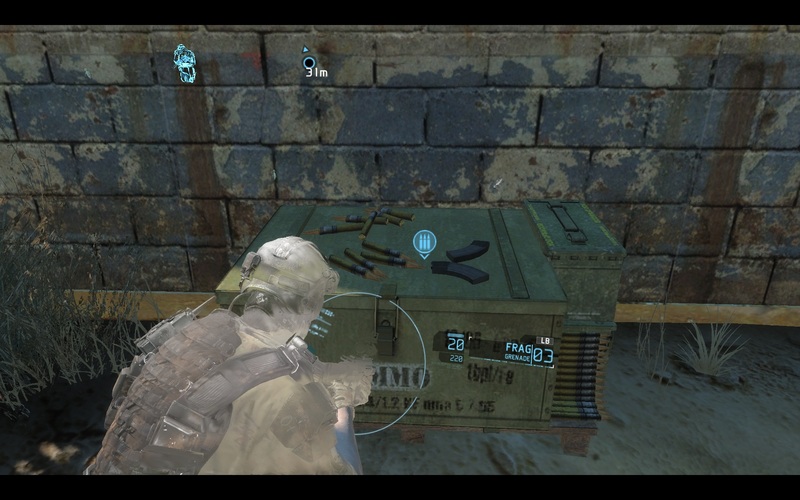 Randomly placed ammo crates that had just what I needed plus some of our tech in it that the enemy shouldn’t have access to just lying around… yeh… that’s not strange at all. The multiplayer is all about running and gunning though since most people don’t like teamwork on online competitive FPS’s. So the running gets a bright light shined on it… and it’s still bad. Not only that, but you are running from cover to cover… which doesn’t always work. So then your blindly running to a place where you can get cover and can’t and then end up getting shot. This isn’t to say I did horribly online, I actually did rather well surprisingly, but it felt horrible. I’d rather punch myself in the face than play the online again. So if the game is going at the tactical pace of slow and methodical, this game sings! If the poop hits the proverbial fan (which it will, it’s an action game, oh yeh and the multiplayer bit) then everything I liked about this game just doesn’t feel good anymore. So that brings up to my new way of wrapping things up here at TVGBL: the Rating Box! Future Soldier would be more fun with some buddies to play with, but you shouldn’t have to feel that way. 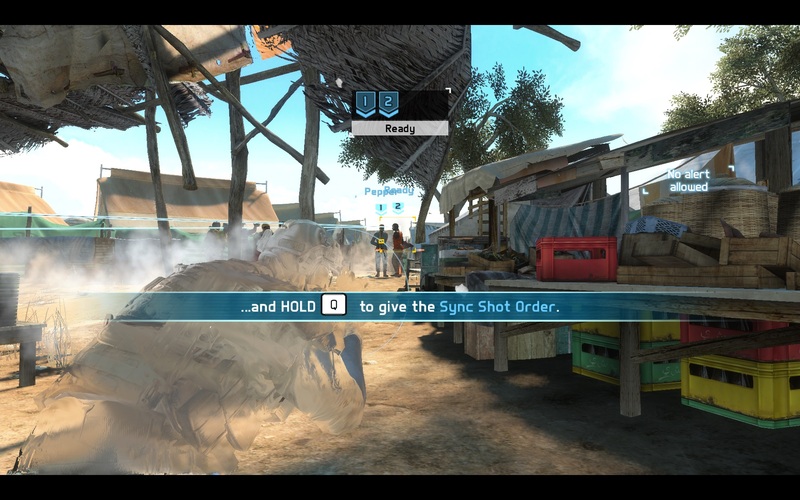 The controls feel like they should be on a console where this kind of crap is excusable I guess, but not on the PC. Bad ports make me feel sad and this should have been the case for Ubisoft who’s FTP Ghost Recon boasts relatively amazing controls compared to this and Ghost Recon Online is FREE! (Was… it’s gone now.) And they wanted to charge you $60 for this? I almost felt ripped off at 65% off on a Steam sale until they gave a stealth mission. The game is almost good. Meh doesn’t mean it’s a horrible game, but that means it’s not great either. If you’re dying for a shooter go ahead, if not, there are plenty of others out there. ← A Sweet Looking Dino Shooter?